In many ways, Leonard Bernstein's Candide is a group of terrific songs in search of a show., and many different hands have been involved in the work since its 1956 premiere (with a book by Lilian Helman). Bernstein himself produced a 'definitive' version in 1989 (which he recorded), based on a new book created by Hugh Wheeler for Harold Prince's productions of the show (developed from 1973 to 1982), but in 1999 when the show was mounted at the Royal National Theatre, John Caird went back to Voltaire's original novel. So any company mounting the piece has to choose, what sort of Candide do they want? None is perfect, yet such is the invention and infectiousness of Bernstein's music, that the songs cry out to be performed. As part of the Bernstein Centenary celebrations West Green House Opera staged Bernstein's Candide in the 1999 Royal National Theatre version. We caught the second of two performances on Sunday 29 July 2018, directed and designed by Richard Studer and conducted by Jonathan Lyness, with Robin Bailey as Candide, Ben McAteer as Pangloss/Voltaire, Fflur Wyn as Cunegonde, Katherine Marriott as the Old Lady/the Baroness, Felicity Buckland as Paquette, Johnny Herford as Maximilian, Nicholas Morton as Martin/James the Anabaptist, and Peter Brathwaite as Cacambo/Grand Sultan. The show was performed by 16 singers, 10 soloists and ensemble of six, with many singers performing multiple roles and taking part in the ensemble numbers. The accompaniment was a band of 16, with single strings. 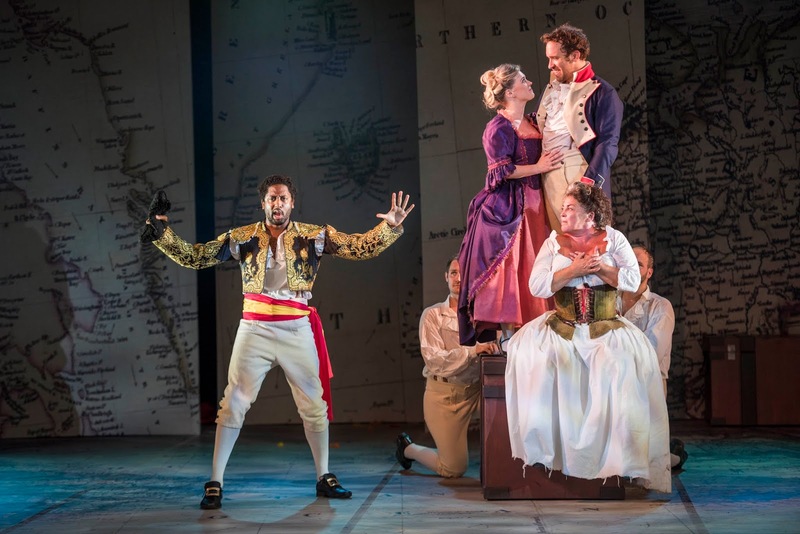 The other problem with Candide, is the question of whether it is an operetta or a musical, the original 1956 performance had a cast which spanned both opera and musical theatre, and has subsequently been performed by theatre companies and opera companies. Perhaps the difference between the two could be seen as the primacy of the text or the music. Despite casting the work entirely with opera singers, West Green Opera decided to perform it with amplfication (sound design Gary Dixon). This meant that Ben McAteer's spoken narrations (as Voltaire) could be heard easily over Bernstein's underscoring, but overall the amplification rather compromised the sound quality. The ensembles were particularly problematic with the sound almost distorting, and it seemed to introduce a certain hardness into the voices, whilst not always aiding comprehensibility of text. Overall, I kept longing to hear the piece acoustically. This aural compromise was a shame, because the cast gave us a terrific performance. 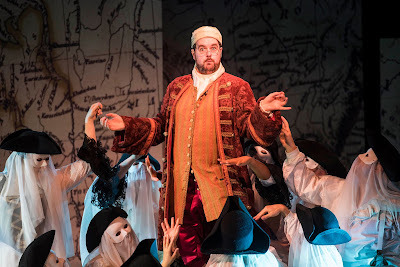 Candide should be fun, and this was great fun with the members of the ensemble all enjoying themselves terrifically, and their enjoyment was truly infectious. The set was simple, just a map of the world as a backdrop and a series of travel trunks which stacked inside one-another (the largest big enough to take Fflur Wyn with the lid closed!). These were used imaginatively, and the ensemble was present for much of the time (choreography Corinne Cowling, who was a member of the ensemble). This created a vivid ensemble feel to the performance. Though this version does sag somewhat in the second half, director Richard Studer and conductor Jonathan Lyness kept things moving and the result was an engaging and enjoyable show. Ben McAteer was simply brilliant in the double role of Dr Pangloss and Voltaire. He has the lion's share of the spoken dialogue, acting as explainer and narrator for much of the time. Here McAteer made a delightful ranconteur, whilst turning the odious Dr Pangloss into a charming mountebank. 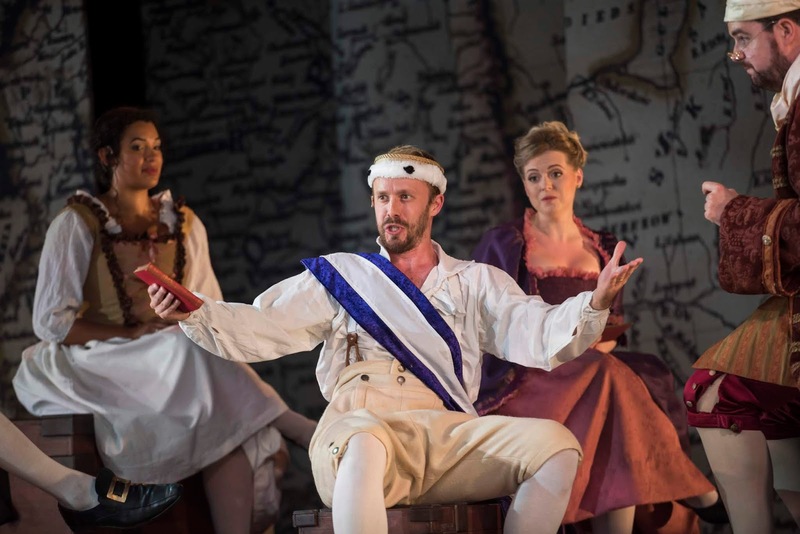 Robin Bailey (a tenor whose career has included membership of the ensemble Voces8 and performing Puccini's La Boheme at the Soho Theatre) made an engaging Candide, naive but not terminally dim. 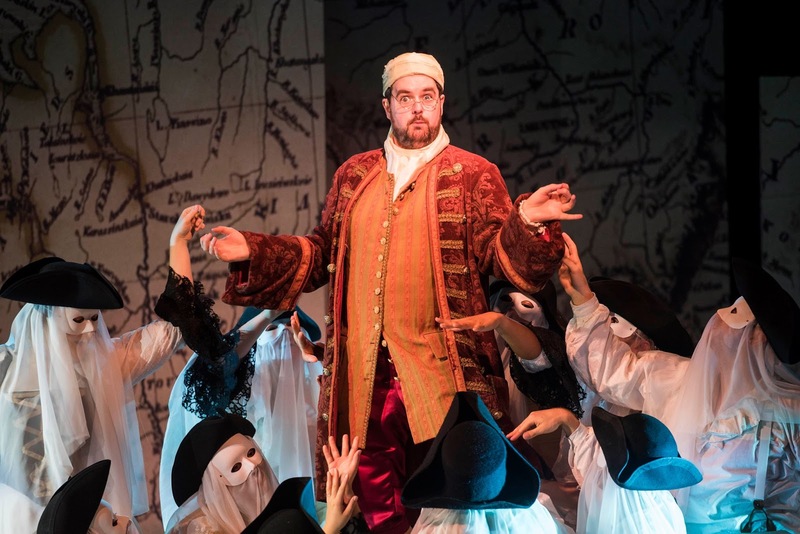 He created a very positive presence on stage, and this combined with a lyrical ease to his singing which made Candide's quieter numbers rather moving. Bailey also got all the words across. Fflur Wyn (whose roles have included Dorinda in Handel's Orlando and the title role in Delibes' Lakme) certainly has all the notes for Cunegonde, but operatically trained sopranos sometimes struggle to bring out the primacy of text and character in the role. There was no problem of that here, Wyn's wonderfully sly and self-possessed Cunegonde was a complete delight, and her account of 'Glitter and be Gay' combined musicality, with a delightful sly wit and oodles of character. Katharine Marriott was great fun as the Old Lady, and her account of 'I am easily assimilated' was truly toe-tapping. But Marriott's assumption of a cod foreign accent meant that words often got swallowed up. Felicity Buckland was charming as the good-time maid Paquette, whilst Johnny Herford's wondrously camp, yet fearsomely proud Maximilian was very funny indeed. Nicholas Morton, Peter Brathwaite, Joseph Doody and David Horton provided admirable support in a variety of roles. Lyness conducted a lithe and lively account of the overture, though perhaps prizing speed over accuracy of ensemble, but overall the orchestra was a vivid and important presence in the mix. 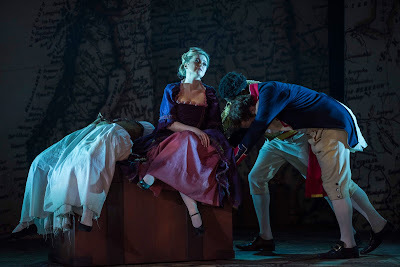 This was a lively and engaging production, imaginatively staged with a hard-working small cast (the Royal National Theatre production used rather great numbers). Musical and theatrical values were really high, and even the choreography seemed nicely crisp. It was only a shame that the amplification rather compromised things, but there was still much to enjoy. Review has nailed it! 'Great songs in search of a show' also rings true for me. For me, Sunday night was reminiscent of pantomime with a silly plot, caricatures and in-jokes, but the music and performances were dazzling. Loved Candide, Pangloss/Voltaire and The Old Lady. Thought the smaller parts were incredibly well sung and acted, too.